Photo credit to the Nebraska Statewide Arboretum @ Fireworks Trail. Here at Great Plains Nursery, we absolutely LOVE the native look when it comes to designing a landscape. 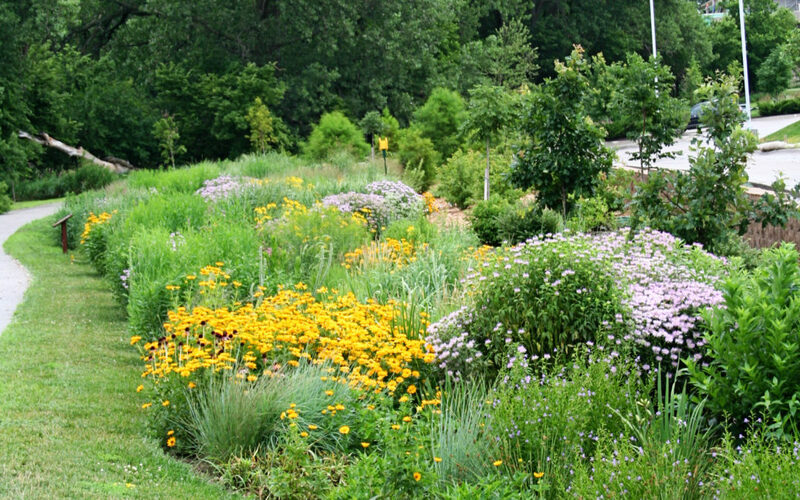 Nebraska has a wide selection of native trees, shrubs, grasses, and perennials so why not utilize them in our landscapes? The way to design with natives is simple: plant in masses and sweeps. This means you use more than one plant in an area, preferably three or more plants in one spot. That’s where the massing comes from. Sweeping means, you extend these masses out and mix them with other masses. It is great to add the same sweep in different areas to have continuity throughout your landscape. For small spaces, this is great to do with perennials and grasses. While in large areas, trees and shrubs are great to use. By using this concept, you will have much more interest and depth in your landscape. Not to mention, tons of beneficial insects and wildlife, such as butterflies, bees, hummingbirds, song birds, and others. Another benefit to this concept is the reduction of weeds. In the initial start of the process you will have to control the weeds by mulching and the occasional spot spraying. But after a couple years, the weed numbers start to decline and the plants you planted will start to establish their root system and thrive. Also, you can conserve more water and be more sustainable. Designing with this concept adds a sense of interest and wonder to your landscape. It makes you stop to look to see what is there and enjoy the outdoors. That is what your landscape is supposed to provide: a place to retreat, relax, and unwind. Design done by landscape designer, Kendra Bretschneider, at Great Plains Nursery.